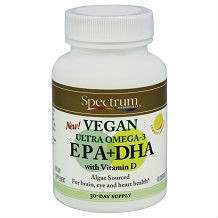 Spectrum Essentials Vegan Ultra Omega-3 EPA and DHA Flax Oil is an omega 3 dietary supplement that offers healthy fusion of EPA and DHA derived from vegan sources, Vitamin D and flax oil. Flax oil, also known as linseed oil is a light yellow colored oil made from dried flax seeds. Addition of cold pressed and unprocessed linseed oil into EPA and DHA (derived from algal oil) and vitamin D2 increase the overall effectiveness of the dietary supplement. The combination of eicosapentaenoic acid and docosahexaenoic acid benefit various organs and systems of the body. They help reverse and prevent heart diseases and stroke by optimizing cholesterol level, reduce the risk of inflammatory disorders of skin, joints and muscles, increase mental concentration, lift up the mood, improve memory and slow down the progress of dementia, Alzheimer’s disease and other age related problems. Studies have shown that both EPA and DHA have a cytotoxic effect, so they might even prevent the cancerous growth of tissues. DHA and EPA build up immunity and help in development of the nervous system. Addition of vitamin D2 means that Spectrum Essentials Vegan Ultra Omega-3 EPA and DHA Flax Oil strengthens up the bones and joints. It can prevent or slow down the course of osteoporosis and diseases that occur due to deficiency of vitamin D.
Unprocessed organic linseed oil – Linseed oil, or flaxseed oil, is known to improve the condition of skin and relieve diarrhea. However, the studies are still going on and its effectiveness is not yet proved. Docosahexaenoic acid – Docosahexaenoic acid is a building block of human brain, cerebral cortex, retina, skin, testicles and sperm. It prevents diseases such as diabetes mellitus type 2, stroke, age-related brain disorders, mood issues, arthritis and many more. Eicosapentaenoic Acid – Eicosapentaenoic acid reduces the risk of numerous diseases such as asthma and other respiratory system diseases, inflammatory disorders of skin, digestive system and joints, and improve mental conditions and mood disorders such as dementia, depression and schizophrenia. Vitamin D (ergocalciferol) – Vitamin D supplementation maintains the density of bones and joints, and prevents respiratory and musculoskeletal disorders. Natural Lemon Lime Flavor to reduce the aftertaste. The quantity of ingredients is not mentioned on the website. The daily recommended dose of the product is 1 tablespoon daily at mealtime. Side effects of the blend are minor and occur in rare conditions. It can cause dizziness, nausea, diarrhea, bloating, vertigo, headache and pain in stomach. 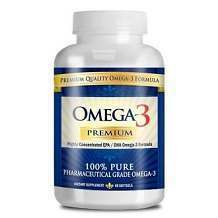 Price of Spectrum Essentials Vegan Ultra Omega-3 EPA DHA Flax Oil is $12.82 per bottle. The manufacturer of the product do not offer any refund policy. Spectrum Essentials Vegan Ultra Omega-3 EPA DHA Flax Oil is a beneficial omega 3 blend, but it might not be as effective as a supplement derived from fish oil. If you want full advantages of an omega 3 supplement, then we suggest you do your research and analyze the many alternatives available.